FB Medical Huber Needles are available with a luer lock hub. Their unique point design promotes easy penetration and maximum life for the port septum.They are non-siliconized to minimise "back out". FB Medical offers a complete range of Huber Needles, straight or 90° curved. They are designed for single use and easy insertion into vascular access device, and may be used for continuous or bolus injections of pain control drugs, chemotherapeutics agents, parenteral nutrition and blood products. 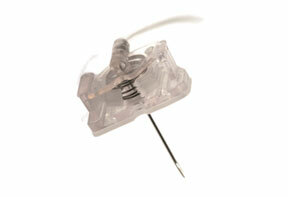 FB Medical offers a complete range of Huber Needles with extensions sets. Non-siliconized needles minimze "back out"
Extension sets are individualy packaged in a rigid blister pack and sterilized with ethylene oxide. 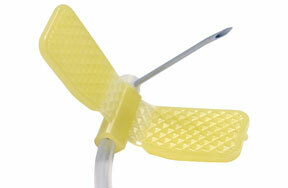 FB Medical offers a complete range of Huber Needles with extensions set and movable wings called Onco-Grip. Non-siliconized needles minimize "back out"
The approximate priming volume is 0.2 ml Onco-Grip are individualy packaged in a rigid blister pack and sterilized with ethylene oxide. Onco-Grip Safe can be removed with one hand and is automatically secured. Positive pressure can be performed with the use of one's free hand. Onco-Grip Safe is single use. The user needs to break the lateral clips and then can easily remove the needle of the injection site without any risk of an accidental jab. 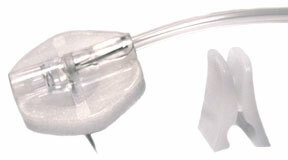 The automatic safety mechanism, combined with the confined needle tip, eliminates a rebound effect. Compared to other similar devices, the relatively small needle ensures increased stability and avoids painful tilting. The automatic safety mechanism, combined with the confined needle tip, eliminates a rebound effect. Compared to other similar devices, the relatively small needle ensures increased stability and avoids painful tilting. The texture of the elastomeric on the patient’s skin is comfortable. The device includes a needle with a phtalates free extension, a closing clamp and a luer lock connector. 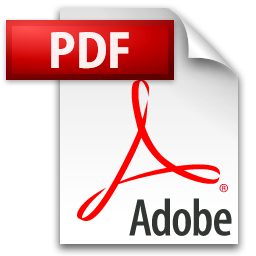 If needed, the device can be obtained with a needle free injection site. The grip, made of POM (poly-oxy-methylene), allows easy handling and safe and easy puncture. The sterile (Ethylene Oxide) needle is provided in a blister pack.